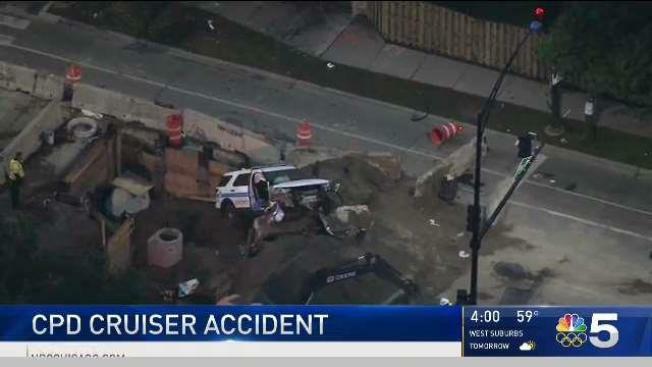 Two Chicago police officers were seriously injured in a crash at a construction site on the city's South Side early Thursday morning. The single-vehicle accident happened just before 4:30 a.m. in the 1100 block of East 83rd Street, forcing both officers to be extricated from the vehicle, according to authorities. The officers were transported to Advocate Christ Medical Center in serious condition, but police say their injuries were not life threatening. Chicago fire officials said they were transported in serious-to-critical condition from the scene. A 25-year-old officer suffered injuries to his left forearm, right leg and right hip and a 33-year-old officer was injured in his right forearm, Chicago police news affairs said. Further information on what happened wasn't immediately released. Area residents said the construction has been going on for weeks on the block. "There are signs everywhere," said resident Alonzo King. Chicago police spokesman Anthony Guglielmi said the third district officers were on patrol at the time of the crash and Supt. Eddie Johnson said they were not in pursuit when the accident happened. "Thank God they are safe," Mayor Rahm Emanuel said at a morning news conference. He added the officers were out at night "doing their job." "We'll find out what happened and do whatever we need to do to make sure it doesn't happen again," he said. Check back for details on this developing story.